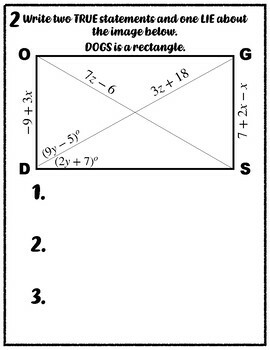 Interactive activity that gets students engaged using mathematical terminology and reasoning. 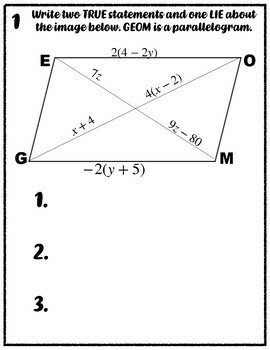 Four problems give students a picture, two truths and a lie. Students are asked to determine which statement is a lie and are asked to correct the incorrect statement. Once students are used to the process, there are four problems with only pictures. 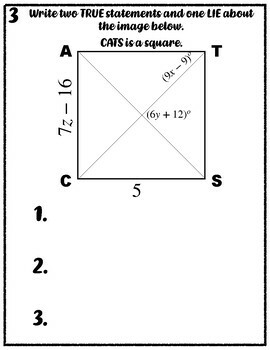 Students must then create statements. After, students do a gallery walk in which they must guess/ correct the lie using a sticky note. 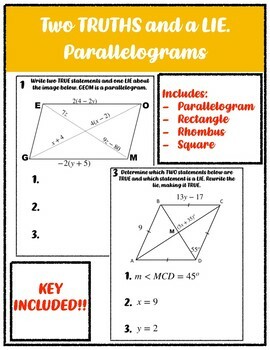 This product includes problems involving parallelograms, rectangles, rhombi, and squares.